official summary: When Gumball sleeps through the delivery of his favorite new toy and it goes missing, it’s up to him and Darwin to set off through town to solve the mystery of the missing toy. Gumball has his sights on one thing: getting the new limited-edition action figure of video game hero Knife Fightgood…except the package turns up missing when he sleeps through the delivery. Knowing the worst has happened--that someone’s stolen Knife Fightgood--it’s up to Gumball and Darwin to find him! Along with Anais, the boys set off through town following the clues to a mysterious underground system beneath Elmore and uncover a truth they never thought possible. 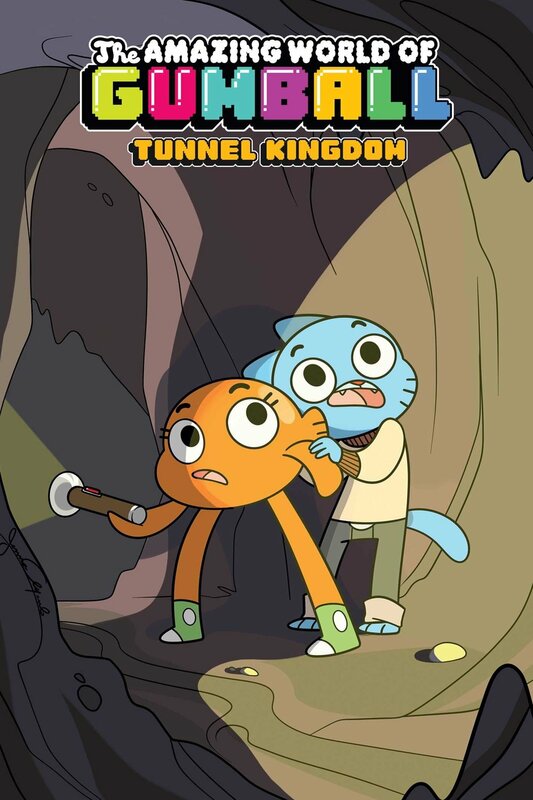 From writer Megan Brennan (Steven Universe, Pencil Pup) and artist Kate Sherron (Regular Show) comes Elmore’s greatest detective caper yet as Gumball and Darwin channel their favorite fictional heroes to unravel the mystery of the Tunnel Kingdom.